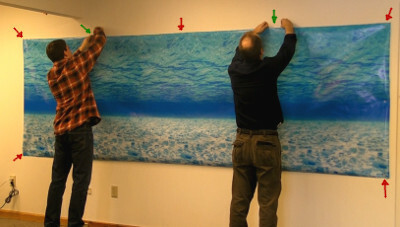 We've covered some ideas about How to Hang Artwork in a few previous articles. It seems that our creative customers have a never ending stream of questions about how they might use magnets to display their artwork, photos, prints, etc. A common question we receive is about how many magnets are needed to hold up a really big print or poster. 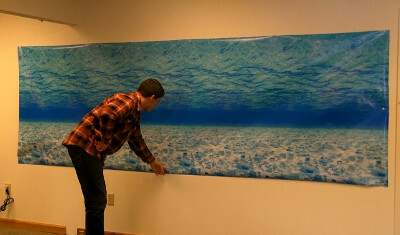 We found a 12 foot wide by 4 foot tall poster of an aquatic background at a local craft store. This seemed like a great size that's large enough to be challenging. Our goal is to hang it on a big interior wall of painted drywall. We want to do it without making any holes in the wall. Our plan is to stick thin, Adhesive Backed Magnets on the wall. Then we can lay the poster on top of the magnet, and place another magnet on top of the poster. The magnets attract to each other through the thin poster, sandwiching the poster in place. We selected our largest adhesive backed magnet, the 1/2" diameter D81AD-P. For the magnets on top of the poster, we choose the D81 magnets. These are the same size, but without the adhesive backing. In the video below, we show the first corner being installed. 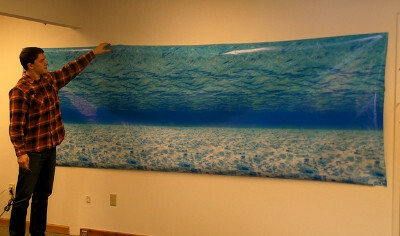 A 12' x 4' poster with a D81AD-P and D81 magnet at each corner. It holds, but sags in between. After sticking four adhesive backed magnets to the wall, setting the poster in place, and securing it with four disc magnets on top, did it hold? Yes! These magnets were strong enough to hold up the poster with just one set at each corner. The problem is, the magnets aren't quite strong enough to prevent the edges from sagging in the middle. There's a limit to how much tension can be put on the poster. It seems that more magnets are required along the edges, especially along the top edge. We add 3 more magnets along the top edge. We added a few more magnets along the top, plus some on the sides. This improved things quite a bit, making the poster lay flatter against the wall. Is this enough for you to hang your large print? Maybe. For hanging one in a dorm room, this looks great. If you're hanging your latest work in an art gallery, you might want a few more magnets along the edges for a flatter, neater look. The size of your print also matters, as well as the material thickness. Thicker paper might lay flatter, but you'll also feel less strength with the magnets. The thicker your paper, the weaker the magnetic force. If you need more force, consider thicker magnets like the D82. Magnets are becoming an increasingly popular way to hang all sorts of things. While we've shared our experience to give an idea of what's involved, please take it as one example of how it might work. You'll probably have to experiment with a few sizes to make things work well with your project. Magnets can be weird: little details like the size or thickness of your poster might make a real difference in how the magnetic setup performs.